MUTIARA Goodyear Development Bhd plans to launch an integrated high-end development project in Taman Melawati by 2010 and has spent RM70mil to prepare the site. Mutiara Goodyear deputy CEO Alex Chiang (left), Hamidon Abdullah, GM sales and marketing Gerald Wong (right) at the Prime Avenue development. According to chairman Hamidon Abdullah the project, which sits on 32ha is located at a scenic hillzone area and set to “become a better alternative than Kenny Hills (Bukit Tunku)”. “We intend to create a new high-end community with Melawati Nadayu,” he enthuses. The project is strategically located as it is accessible via major highways and is 25 minutes away from KL city. It will comprise 142 units of high-end bungalows and 46 units of superlink homes and located at close proximity to modern conveniences and an International School. “This township would be different; most bungalow townships are set in small pockets with maximum units of 50-60 bungalows in the area,” he says, adding that Melawati Nadayu is all about luxury bungalows in a hillside setting. Hamidon adds that the company is mindful of the safety aspects of hillzone properties as it prepared the earthwork and infrastructure at the site. “The site will be proper and it will be well blended within the environment. Most important the site will be safe. “It is a hill area and there are concerns. But we are a responsible developer. It has taken us two years to prepare the site and we were overly critical in addressing the terrain,” he adds. Meanwhile, Mutiara’s Prime Avenue project at Dataran Prima is poised to become a hotspot for work and play. In what he calls a “new manifestation of space”, he says the concept originated from a shoplot but has taken a different twist. Prima Avenue boasts beautiful landscapes and ample space for people to congregate. “While today it is a medium-end location, it could very well be a high-end in time to come,” he points out. Prime Avenue is accessible via three different routes, New Klang Valley Expressway, Lebuhraya Damansara-Puchong Highway, Sprint Highway and Federal Highway. Developed by Puncak Kencana Sdn Bhd, a wholly owned subsidiary of Mutiara, the project takes up 1.36ha of freehold tract within Dataran Prima. “Mutiara’s expertise is in acquiring sites which were previously not considered choice locations and transforming them into up-market and high-value property investments,” he says, adding that it plans to launch RM1.5bil properties starting from November till end-2010. Prime Avenue will consists of two office towers development with a total GDV of RM122mil comprising 342 office suites as well as 33 double-frontage shop office duplexes housed in a retail podium called The Tube. Each tower will house 171 office suites on 12 levels, while the rest will be parking lots. Units are priced from RM174,000. The single-level executive suites come with built-up of between 603 sq ft and 1,635 sq ft, while duplex business suites have built-ups from 1,186 sq ft to 3,250 sq ft. Phase 1 is 85% sold and phase 2 is open for sale now. SUNWAYMAS Sdn Bhd, the property arm of Sunway Holdings Bhd, is looking to stamp its mark as a prominent high-end developer, says executive director Andy Khoo. “The economic downturn has not had much of an impact on the high-end segment. Property prices within this segment have even escalated,” he tells StarBizweek. Khoo is clearly optimistic about the prospects for the local property sector in 2010. He says SunwayMas would be focusing on integrated commercial developments for 2010. The boutique developer currently has two ongoing (integrated commercial development) projects within the Klang Valley – Sunway PJ@51a and Bangi Integrated Commercial Centre (BICC). Sunway PJ @51a will comprise 88 office suites, 11 retail outlets and six showrooms. Located next to Cycle & Carriage, the development is accessible via the Federal Highway, Jalan 225 via Jalan SS9A and New Pantai Expressway. The company says its BICC project will be a “first-of-its-kind” development in Bandar Baru Bangi, comprising dual frontage, four-storey shop offices. “Both projects are under construction and the progress has been healthy,” Khoo says, adding that SunwayMas was also looking for opportunities to embark on other projects within the Klang Valley. “We have about 120ha of undeveloped landbank there and we are always looking for opportunities. We are also constantly looking for landbanks,” he says. SunwayMas has commenced work on its first high-end residential development in Melawati Heights. Called Sunway Rydgeway, the project will comprise 40 bungalows and 30 semi-detached homes with a gross development value of RM180 when construction is completed in 2011. Khoo says the project is 20% complete and the semi-dees have been snapped up while only six bungalows are remaining. “We felt that it (Melawati) was a nice area to build a boutique development. It is a matured township, but there were still pockets of undeveloped land and we ceased the opportunity to embark on our own project,” says Khoo. Inspired by the word ‘ridge’ which refers to a place on elevated ground, Sunway Rydgeway overlooks a quartz ridge. Khoo notes that potential purchasers and investors were cautious about hill-slope developments after the landslide disaster at Bukit Antarabangsa earlier this year). However, he ensures that the homes were safe to inhabit. “Our projects are on flat, elevated land,” he says, adding that the encouraging take-up rate experienced to date clearly indicated that the design and concept of the homes were what purchasers have been looking for. A lot of effort was put into maintaining and conserving the natural environment and surrounding landscape, Khoo says. Security features at Sunway Rydgeway will include an external fibre option CCTV system, home alarm system and unlimited intercom system between the residents. On another note, Khoo says the Government’s proposal to reimpose the real property gains tax (RPGT) of 5% effective Jan 1 could have an impact on the secondary market. However, he adds that buyers and investors should be happy that the RPGT was capped at 5% and not higher. The Star Property Fair will make its debut in Kuala Lumpur on Nov 27. The three-day fair will be held at the Kuala Lumpur Convention Centre. Themed “Stylish Living”, the fair will showcase wide-ranging property developments, including superbly-designed condominiums, luxurious bungalows and affordable link houses, to cater to everyone. There will also be public auctions by CIMB Property Mart that feature many noteworthy properties. Big names in the country’s property development landscape will showcase their projects namely SP Setia Bhd, Sime Darby Bhd, Sunway City Bhd, Lucky Bright Star Sdn Bhd and KH Land Sdn Bhd. Visitors will also have the opportunity to obtain advice on financing options from participating financial institutions, and attend talks and forums by industry experts on property investment, feng shui and home aspirations. Renowned bestselling Malaysian author and speaker, Captain Azizi Ali, will be sharing his secrets on how to be a property millionaire. There will also be a special guest appearance by supermodel Amber Chia and her interior designer Edwin Cassian, where they will talk about the design and theme of her home and also provide tips and ideas on interior design. There will be a contest for visitors with prizes worth over RM20, 000 to be won. Interested home buyers or property investors should therefore mark their calendar for the upcoming Stylish Living Star Property Fair 2009. For more information on the fair, log on to www.starproperty.my. It was a prestigious night as the creme de la creme of the country’s property sector were honoured at the International Real Estate Federation (FIABCI) Malaysia Property Award 2009 on Monday. Dubbed the “Property Oscars” by industry players, the highlight of the night was the ‘Property CEO of the Year’ award that was bagged by Malaysian Resources Corp Bhd (MRCB) group managing director Shahril Ridza Ridzuan, who humbly attributed the win to his MRCB team. MRCB group MD Shahril Ridza Ridzuan with his Property CEO of the Year award. “I am very thankful to my team at MRCB who are instrumental in me winning this award. It is a testimony to all the hard work done by them. I am just lucky to be their CEO at this point in time,” he said. “This will also give my team a lot of motivation going forward in terms of the business and improving the (quality) of the properties for the future as well,” said Shahril. No less important were the six other awards that were presented the same night to some of the top property developers in the country. The winners were UEM Land Bhd’s Puteri Harbour in Nusajaya, Johor (Master Plan Category); SDB Properties Sdn Bhd’s Park Seven in Kuala Lumpur (Residential Development – high rise); Perdana ParkCity Sdn Bhd’s Adiva in Kuala Lumpur (Residential Development – low rise); Boustead Curve Sdn Bhd’s The Curve, Mutiara Damansara in Petaling Jaya (Retail Development); Menara Hap Seng Sdn Bhd’s Menara Hap Seng in Kuala Lumpur (Office Development Category) and MRCB’s Sooka Sentral in Kuala Lumpur (Purpose-Built Project). Boustead Curve’s director Datuk Ghazali Mohd Ali said winning the award was another milestone for the company. Boustead director Datuk Ghazali Mohd Ali with his award for Boustead Curve Sdn Bhd’s The Curve. Perdana ParkCity group chief executive officer Lee Liam Chye was clearly thrilled. The event was held in a glittering ceremony at The Shangri-La Hotel, Kuala Lumpur. It was graced by the Sultan of Selangor, Sultan Sharafuddin Idris Shah and attended by local and foreign guests. The 2009 Malaysia Property Award was organised by FIABCI Malaysia, with Malayan Banking Bhd as the official sponsor. The emphasis for this year’s event was “Intrinsic Value in Holistic Living”. Winners of the Malaysia Property Award in their relevant categories will represent Malaysia next year at the International Prix d’Excellence in Bali, Indonesia. In fact, if you were to ask anyone who had suffered equity losses, they would most certainly reply that they wished they had bought one more condominium unit in Mont Kiara or taken up the beautiful service-apartment in KLCC two years ago. For many Malaysians, property investing is not a new thing. There are people who would rather buy a property than put their money in other investments. And some wealthy individuals have even come together to develop small-scale property projects. Properties seem to be keeping up in terms of value, especially if you have the holding power and the location is good. And more importantly, a property is tangible – you can look, touch and even smell them literally. Why is property investing such an investor’s darling? Many die-hard property investors would say that they make money and receive rental income through their property. So investing in a property does indeed sound like a good buy. However setting aside the benefits, there is one thing that many are generally unclear about: property investing comes with significant leverage benefit – that is, buying a property that is worth a lot more than what is paid at the onset. Most of the time, a property investor does not have to pay 100% of the property price because one would take a property loan from a bank. For example, if you take a loan with a margin of 80%, a RM1mil house would actually cost you RM200,000 upfront. The remaining 80% is paid off through regular mortgage payments. On average, a property loan lasts for about seven to eight years, even though the legal tenor is 20 or 30 years. It is conceivable that a few things may happen within these seven to eight years, for example, the buyer of the property sells the property, or reduces his loan liability through pre-payment. Using the previous example, let us assume that the price of the property has increased to RM1.2mil in three years. The total investment cost is the initial investment of RM200,000 plus other fixed costs. So the gross profit is RM200,000, or 100% based on the initial upfront payment. Of course, the net profit will be lower, depending on the fixed costs incurred for mortgage interest, legal costs, et cetera. It is not uncommon for very serious property investors (and speculators) to pay only 10% upfront and take out a loan for the remaining amount. At 10%, the leverage is ten times! This means that if you make a 10% profit on the property value, the leverage would equate to ten multiply by 10% or a total of 100%, before deducting the cost of borrowing. The converse is true, if you have to sell your property at a 10% loss in value, you may not recover enough from the sales proceeds to pay off your outstanding loans. In such cases, you would have effectively lost your initial upfront investments plus all the associated costs. One of the true dangers in using leverage is linked to the cashflow level of the investor. If you are financially strong, you can continue to hold on to the property even during the downturn. And if there is good rental income, you can further sustain the mortgage repayment. However, if you cannot repay the mortgage, the risk is possibly foreclosure. The United States is a good example where many mortgagees could not afford to service their loans as interest rates rose. Creditors had to foreclose and force-sell properties to recover the outstanding loans. When dabbling in property investing, it is noteworthy to understand and take note of the leverage factor or loans taken up. The effects are not very different from margin investment. A quick reflection on past market turmoils like the 1997-1998 crisis will enable one to immediately understand that leverage cuts both ways – magnifying the profits and losses. After all, property investing, like any form of investment, can be profitable and carry risks at the same time. So before you jump into purchasing your next property, do bear in mind this leverage effect. 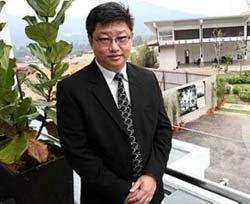 Tay is senior vice-president and senior head of UOB’s personal financial services division. PENANG should make its historic downtown area in George Town a centre of innovation, said a World Bank economist. By housing research institutes and post-graduate institutions in the area, World Bank economic adviser Dr Shahid Yusof yesterday said that the island state can lure foreign students to its shores. "As Penang repositions herself, intellectual hotspots in the downtown area can make Penang an attractive place, especially to students from overseas," he said during a talk at the Wawasan Open University in Penang. The lecture is part of a series of regular talks in Penang organised by Khazanah Nasional Bhd. George Town's heritage enclave, which has been inscribed on Unesco's World Heritage List, is currently home to a pool of heritage-rich buildings, many of which would be suitable for learning institutions. Apart from financial houses that have sited their premises in the historic buildings, education institutions like the British Council and George Town College are found in pre-war premises. In his talk, Shahid, who is an expert on development issues, said that a big policy change is needed to re-energise industrialisation in countries where it has slowed, and to "nudge" it in directions with the brightest long-term prospects. "The least controversial elements of industrial policy," he noted, "encompass building capacity in areas conducive to industrialisation. "Capacity is especially critical in transport, telecommunications and energy infrastructure, technical and scientific skills and research," he said. He said universities have to play a key role in producing quality talent. "There is also a need for these learning institutions to co-exist with some kind of research institutes or think-tank."